Over the holiday season many of us spend time with family and friends – we may take holidays or perhaps we just take things a bit slower. I must admit, I always enjoy that time between Christmas and New Year when things quieten down on the work front and I can focus more on enjoying my family, or just relaxing and reading a good book. But not all of us have happy memories or activities to look forward to. Some older people are living away from their immediate family, and their friends may be involved with their own families, leaving these people at home alone at this time of year. Loneliness isn’t just about being alone – it’s about not feeling connected. I’ve noted a few articles over the past year describing the rise of the loneliness epidemic. Loneliness is not limited to the older generation, with many reports indicating it transcends all age groups, however the elderly have often lost much and have become disconnected from social groups they may have been part of and support networks. They may have lost life partners to death, or through separation. They no longer have work colleagues to interact with on a regular basis. They may be unable to attend regular activity groups or religious ceremonies due to physical limitations. Sons and daughters may have moved away due to work commitments – and not just interstate, perhaps to another country altogether. Our greatest need — after food and shelter — is social connection. It’s those connections with others that people consistently rate as contributing the most to their happiness, coming in above physical health, fortune or fame. The elderly face a network that is shrinking, with fewer significant relationships. 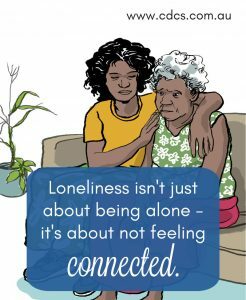 For those living on remote communities where they are surrounded by extended family members, you might think that loneliness wouldn’t be an issue; and for many it’s not. But for some people, the sense of disconnection between what their generation grew up with and what they are currently experiencing leads to frustration and loneliness. The impact of this loneliness is reflected in our health status. Researchers are saying that loneliness negatively impacts our cognitive functions. There is also mounting evidence that it increases the risk of heart disease, stroke, depression, anxiety, dementia and even an increased risk of falls. Loneliness is not just an Australian phenomenon; the same issues are highlighted in many other parts of the developed world. Donna was in India recently and found that the elderly living in that country weren’t immune to the problem either. In India, if the family can afford it, younger people are encouraged to become educated and seek better prospects in other countries. The elderly mother, still living in India, may be better cared for these days, but her children may be scattered across the globe. As these widows age and can no longer travel to visit family, they find themselves increasingly isolated within their own society. Having purpose and connection is a common theme across all cultures. When people can’t feel useful and able to contribute, it can be very depressing, especially when they can’t keep up like they used to. In Western countries, the desire for independence and the nuclear family has left many widows living alone, perhaps in their large family home. The mobility of our population means that these seniors have probably experienced new neighbours every 10-15 years. Their new neighbours have busy lives of their own and the older person may not know, or be able to relate to their current neighbours. In country towns, we’ve seen the younger generation move away to the cities in search of better education or work prospects, leaving their elders living in townships with gradually diminishing populations and services. Now I’m not saying that everyone who lives alone is lonely. Most of us enjoy a degree of solitude, some more than others. It allows us the opportunity to reflect and rejuvenate. It’s when solitude is forced upon us, when our social connections are limited for some reason, that loneliness arises. But how can we help those we support who are experiencing loneliness? Recognising and acknowledging the person’s situation is the first step. By getting to know your client’s current connections, as well as their past experiences, you can gain some insight into whether the person might be experiencing loneliness. If the person is experiencing loneliness, try to establish what the contributing factors are and if there is anything that your service can do to help address them and support the person in reconnecting with family or people in their community. If the person can no longer drive to church, can a regular lift be arranged? If the person is hesitant about leaving the home due to incontinence, can you help them get an assessment with a continence advisor and access to continence aids? If they are having trouble getting out of the home due to issues with walking distances, can they purchase or hire a scooter or motorised wheelchair? If the person is unable, or unwilling, to leave the home, can you put them in touch with a Community Visitor scheme or other visiting service? If the person enjoys meeting up with a particular old friend, can you arrange to take them to the person’s place or to a coffee shop to facilitate a meeting? If the person is missing their family, can you help them learn how to use online tools such as Facebook or WhatsApp to keep in contact with family? You may also need to assist the person to establish an Internet connection if this has not been set up before. If the person has a particular interest, such as quilting or scrapbooking, can you help them find relevant interest groups? Does the person enjoy singing? If so can they join a local choir? If there are local community events being held, like parades, BBQs, or movie nights, can transport and support workers be rostered on to help get people there and back? Some clients will simply enjoy having a support worker sit and have a cup of tea and a chat with them after completing the cleaning or other services. Allow time for this if there is capacity in client or service budgets to do so. This can be a valid contribution as ‘social support’. Remember though, you can’t necessarily solve every factor that contributes to loneliness. Sometimes the person needs to work with a professional counsellor; their General Practitioner can assist them with a referral. If you found this article interesting, why not share it with others in your network who may also gain something from it. We publish regular articles on our website, please take the opportunity to sign up to our monthly email alerts where we provide a round up of the month’s posts and other significant industry related news.